Movie Review - 'What Maisie Knew' - A Modern 'Maisie,' Still Yoked To Absurd Adults Henry James' put-upon Victorian heroine is now the child of a present-day rock star and her philandering husband, but the dynamics among the observant Maisie and her feckless parents are as painful and revealing as ever. By the end of What Maisie Knew, what 6-year-old Maisie knows is the thing everyone in the theater has figured out in the first five minutes: This poor little girl has two of the most horrible movie parents since Faye Dunaway got her hands on a wire hanger. They fight or are distracted so much that Maisie is often left to her own devices, making herself meals or scrounging for cash to pay for the pizza her parents ordered. Her father, Beale (Steve Coogan), runs off with the nanny, Margo (Joanna Vanderham), and that's just the first in an endless string of abandonments and other outrages. 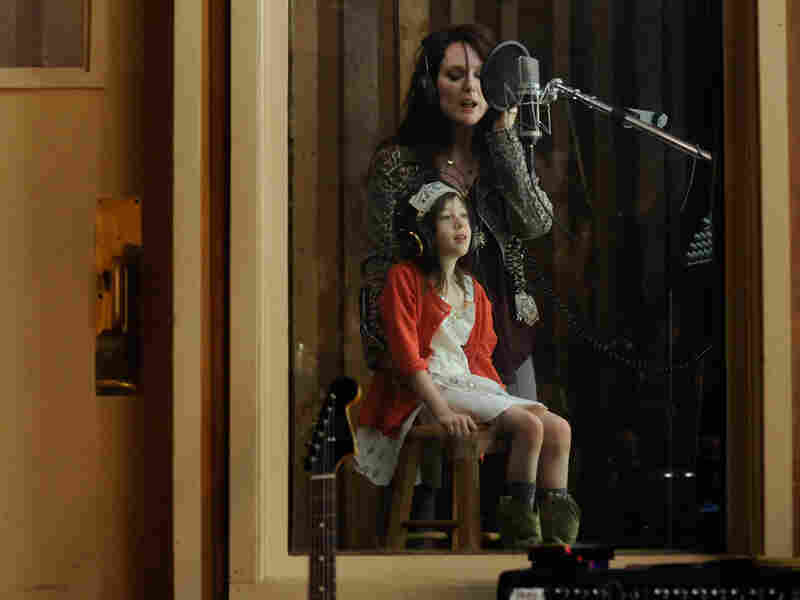 Susanna (Julianne Moore), Maisie's rock-star mother, invites one of Maisie's classmates over to stay the night, just to try to get the kid's mom to say a few nice things about her in the impending divorce proceedings. Problem is, she schedules the sleepover for the same night as a booze-and-cigarette-filled hangout with her band and assorted hangers-on. The friend goes home sobbing in the middle of the night. This couple is poison to anyone with the misfortune to wander into their decaying orbit. Based on the 1897 novel by Henry James, this adaptation from co-directors Scott McGehee and David Siegel moves the story from Victorian England to modern-day New York City. It's a loose update, but importantly, the aspect of James' book they attempt to retain is a key one — that this character study about the fallout of divorce and competitive parenting should be told from Maisie's perspective. To that end, visually, their camera is often at Maisie's eye level, cutting off the adults at the top of the frame or tilting to look up at them when she does. The adults only exist, really, inasmuch as they are observed by the quietly perceptive Maisie. And she's the sort of child who can walk into a room and watch what's going on for a while before anyone notices her — much longer in the case of her wildly self-involved parents. Julianne Moore plays the hard-partying rock singer whose marital crisis kick-starts the film's plot. The technique works, thanks in large part to one of those precociously naturalistic child-actor performances from the sad-eyed Onata Aprile. She's not the only one making these lives feel honestly lived-in, though; the entire cast is doing standout work. Coogan has made a career of playing the sort of egotist he inhabits in Beale, and Moore astutely goes right up to the edge of making Susanna an irredeemable monster before backing off and giving her just a touch of humanity. The real surprise is Alexander Skarsgard as Lincoln, a sweetly naive bartender whom Susanna marries in a hurry, purely out of revenge — Beale has married Margo immediately after their divorce. Skarsgard, best known stateside for his brooding intensity as Eric on HBO's campy vampire soap opera True Blood, plays Lincoln as the tender, caring parental surrogate Maisie needs, presenting him at first as a bit of a simpleton, but then ensuring that that first impression gives way to a sense that he simply shares a childlike natural trust with his new stepdaughter. Margo and Lincoln, unfortunately, are as much pawns in the bitter, nasty games that Beale and Susanna play with each other as Maisie is. That does give the three something in common, of course, all of them being human collateral damage in the constant emotional warfare. It comes as no surprise when the real parents' neglect of both their partners and their child brings the castoffs together into an alternate family unit. The honesty of these performances helps compensate for some clumsiness in the plotting; screenwriters Nancy Doyne and Carroll Cartwright sometimes seem unsure how far to stray from James' text. Mrs. Wix, the elderly woman who takes over as Maisie's nanny, is a key character in the book, for instance. In the movie she's reduced to a single brief scene before disappearing entirely, never to be mentioned again. Her appearance feels as if it comes out of a sense of duty to the original rather than to the film that's actually being made; leaving her out completely would have made more sense, given that the filmmakers want to concentrate on the contrasts between Maisie's relationships with her real parents versus her unofficially adoptive ones. The film raises more uncomfortable questions about Maisie's uncertain future than it ever answers, but that's in keeping with the emotional honesty the filmmakers are striving for. If Maisie knew everything, there'd be nowhere left for her to go after the credits roll.